Movie day yesterday, three movies – two of them excellent. We started off with Roland Emmerich’s Anonymous – the story of the political and royal intrigue that forced a talented Elizabethan playwright to hide his identity behind that of an illiterate actor called William Shakespeare. 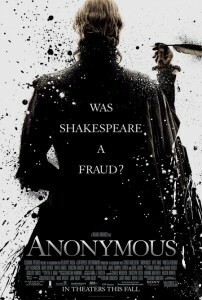 Very entertaining, even if the theory that Shakespeare is not the real author of Hamlet, Romeo and Juliet etc. is considered nonsense by most scholars. Next up was Drive. Based on the book by James Sallis , starring Ryan Gosling and directed by Nicolas Winding Refn, it’s a stylish thriller filled with meaningful silences and sudden bursts of graphic violence. Just my sort of film and I’ve just added the eBook to my wishlist. Last of all we watched Simon West’s remake of When A Stranger Calls. This was actually better than I expected and there were some genuinely creepy moments although advances in telephone technology rob it of some of its effectiveness. If you’re tempted, I recommend you watch the Fred Walton original from 1979 over the remake. Either way, if you’re not familiar with the twist that comes towards the end of the film, don’t watch the remake’s trailer – it includes a spoiler. Movie day took up most of my writing time, but I did submit a story to Lovecraft eZine.